October 11, 2017, 5:31 PM · For a violinist, there is nothing more frustrating than being held back by the sound of an inadequate instrument. As a young student, I played on a laughably inadequate violin, and I blamed myself when I couldn't find the right tone, could not make it speak in certain registers, or could not project. I realized the value of a better-sounding violin only later in life, when I finally found and bought one for myself. That violin continues to teach me and help me grow as a musician. Because of this experience, as a teacher I'm even less patient when I discover a hard-working student laboring with an instrument that will never allow him or her to progress beyond a certain point. In fact, I feel a keen need to do something about it. 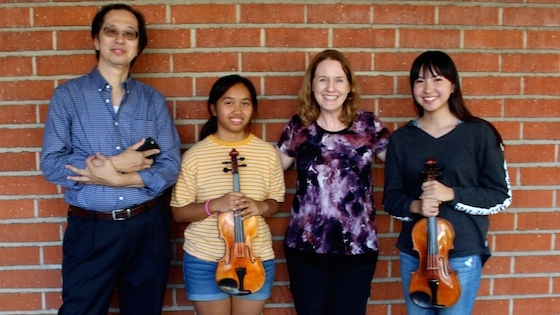 That is why I am happy to announce that on Monday, Violinist.com awarded violins to two students at the Los Angeles County High School for the Arts (LACHSA) The students are Ruka Nagashima, a senior, and Cayla Mendoza, a freshman. R-L: LACHSA string orchestra director Fung Ho; LACHSA freshman Cayla Mendoza; Violinist.com editor Laurie Niles; and LACHSA senior Ruka Nagashima. LACHSA is a competitive, audition-based, public arts school that draws students from all over the Los Angeles metropolitan area. The music department's need for some better-quality instruments came to my attention through my son, Brian Niles, who is a senior at LACHSA in the Cinematic Arts department. The Violinist.com Instrument Grants were based on merit and need, through an application process involving both an essay and audition, in consultation with LACHSA's string orchestra director Fung Ho. Nagashima, a senior, received a new, 2015 Hiroshi Kono violin as a permanent grant. Another Hiroshi Kono violin was awarded to LACHSA's instrumental music program, to loan on a yearly basis to a promising student in need of a better-sounding instrument. This year, the violin was awarded to Mendoza, a freshman. I hope these violins allow these students a chance to start hearing the difference at an early age, to enjoy the new possibilities and to grow as musicians. What is the best quarter-size violin? October 12, 2017 at 02:08 AM · That's wonderful for the students and for the school! Funny how high school football seems to get all the equipment it needs, but music departments usually don't. The high school in my town doesn't even have an orchestra, because they don't have a teacher who can do that. The marching band, on the other hand, is doing just fine. My current violin, which I used as a child, is very old and is nothing special. A classmate in high school lent me, for several months, a much better violin and it really made a big difference. I hope to upgrade someday, but don't yet feel the need. October 12, 2017 at 03:44 AM · This is a spectacular initiative. Money shouldn't be a barrier into the arts, and anything that works towards breaking down barriers is great. Thank you for your continuing contributions to music! October 12, 2017 at 11:55 AM · Wow. That's a lasting contribution. Good for you and good for v.com. October 13, 2017 at 01:45 AM · This is welcome and wonderful news. October 13, 2017 at 09:23 PM · This is a very good thing you've done Laurie. October 14, 2017 at 06:50 PM · This is a great scheme. Where do you source those loaner violins?